Here’s something for the big bike fans. Introduced in 2009, the Victory Vegas 8 Ball and Hammer 8 Ball cruisers were an instant hit. Black, low and minimalist, they were great value for money. For 2011, the Vegas 8 Ball has set the bar high and the price low. Now standard with the blacked out 72 kW/ 153 Nm 1731cc 6 Speed Freedom V-Twin, the 8 Ball features black bars, forks, swingarm, chassis and exhausts, the blacker the better. But the biggest news is the price. Despite the bigger motor and 6 speed gearbox, you get more black for less, at just US$19,995 ride-away. The trend continues with the all new 2011 Hammer 8 Ball. The Hammer 8 Ball joins its Hammer S stable mates with the biggest motor Victory make. 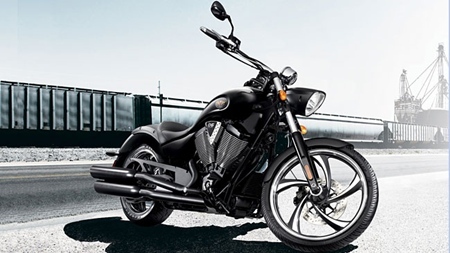 The 72 kW/153 Nm 1731cc Freedom V-Twin is now the benchmark in American cruisers. With the 6 speed overdrive gearbox, a fat 250 section rear tyre, coupled with an 18 inch front wheel and inverted forks and you have a real muscle cruiser. It is available only in black of course with black trim. With a waiting list already building, the line for the Hammer 8 Ball will see you ride away at just US$24,995. Unfortunately, those are the prices in the US – by the time you bring one out to Thailand, you can probably double that price. Previous articleGM back on top?